class="post-template-default single single-post postid-335755 single-format-standard group-blog masthead-fixed full-width singular wpb-js-composer js-comp-ver-5.7 vc_responsive"
MANHATTAN, Kan. — If you’ve attended a K-State Research and Extension wheat plot tour in the last few years, you might remember the K-State Specialist mentioning the dangers of stem rust and the increasing use of susceptible varieties. Although the disease has been well controlled lately, stem rust is a potential threat every year. 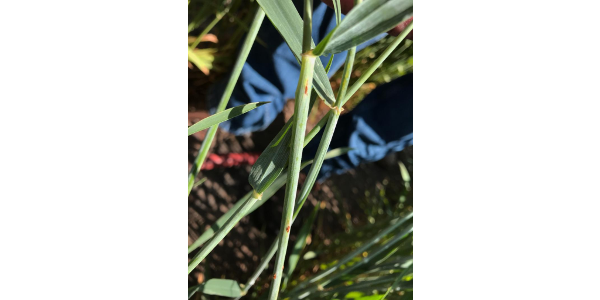 During the 1980’s and 1990’s, it was not uncommon to see the disease plaguing fields, and in 1986, wheat farmers saw the most devastating yield loss from stem rust since the early 1960’s. Since then, the control of stem rust has remained fairly consistent due to farmers planting wheat varieties with genetic resistance. According to Bowden, there are three main risks from planting wheats that are susceptible to stem rust. “First, stem rust can cause direct yield and quality losses in fields of susceptible varieties. Second, rust spores can spread to other farmers’ fields in the local area and beyond. Third, susceptible varieties allow the pathogen population size to increase dramatically,” Bowden said. Raising the pathogen population size raises the probability that new races of the fungus will arise by mutation that could overcome existing resistance genes. “We only have a few good, effective resistance genes and so we can’t afford for them to be defeated by new races,” Bowden said. Although the impact of stem rust has diminished over the last 20 years, its damaging consequences make it hard to ignore the potential risks it poses. Farmers need to make sure they’re taking the right precautions to limit the chances of possible devastating yield loss from the disease. “In Kansas, we are currently benefitting from the fact that most Texas wheat farmers are avoiding stem rust-susceptible varieties, and thus not sending us stem rust spore showers every spring on southerly winds. We need to keep up our side of the deal. I would encourage farmers to avoid susceptible varieties unless they have a pre-planned fungicide application lined up,” Bowden said. Daryl Strouts, Kansas Wheat Alliance CEO, says some easy choices for growers to plant include KWA’s K-State wheat varieties Joe, a hard white winter wheat and Oakley CL, a hard red winter wheat. Both provide resistance to stem rust while also addressing the wheat streak mosaic virus issue present in western Kansas. Strouts also notes KWA’s Larry, Tatanka and KanMark would also fit well into operations not willing to risk a stem rust outbreak as they all have resistance. By planting varieties with resistance, we can lower the concern of an outbreak possibility in Kansas. Do not let the forgotten scourge of wheat gain a foothold by planting susceptible wheat varieties. To learn more about K-State’s stem rust-resistant varieties, visit KWA’s website at http://kswheatalliance.org/ where you can learn about variety performance and where to buy.